Click on the link to view Full results from this years Sult na nÓg h.. Details for this years Scoil Fonn 2019http://kerrycomhaltas.ie/content_page/1004.. RESULTS 2019 LIXNAW FÉILE FEABHRA Banjo U101st Emma Rose..
Full results from Ceol an Gheimhridh Chiarraí 2018 can be found on the li..
New updated Child Protection Policy and Risk Assessment/Safeguarding Statement c..
10th Garry McMahon traditional singing weekend takes place in the Ramble Inn bar.. Please find attached a letter explaining more about a planned seminar on the tea..
Harpers for Heritage When: 2pm Saturday August 25th 2018 Where:The Schoolho..
Download the full list of results from this years 2018 Fleadh Cheoil na hÉ..
Best of Luck to the following competitors who will represent Kerry at this weeke..
Full Results from this years Fleadh Cheoil na Mumhan 2018Fleadh Cheoil na Mumhan..
Stockton’s Wing return to Milltown after 20 years When Milltown-Listr..
Ní fada anois go mbeidh Fleadh Nua faoi lán tseoil in Inis Co. an ..
ALL-IRELAND CHAMPIONS FOR FRIDAY NIGHT CEILITriple All-Ireland winning cé..
Full Results from 2018 Sult na nÓg Competitions held in the IT Tral..
Munster Final of Ceol an Gheimhridh on in Hazelwood College, Dromcollogher on Su..
Ceol an Geimhridh 2017The Saturday programme at Ceol an Gheimhridh i.e Music, Si..
AN AWARD FOR SERVICEThe Ardstiúrthóir of Comhaltas Ceoltóir..
Venue'sDUBLIN FAREWELL CONCERTSunday 8th October | 8.00pmCultúrlann n..
Fleadh na Mumhan ResultsCork City18th - 23rd JulyResults from this year's Fl.. The Folk Orchestra including Alannah Kissane and Donagh McElligott from Kerry th..
Con Curtin Music Festival 2017 23rd - 25th Junehttps://www.facebook.com/concurti..
Con Curtin Music Festival 2017 23rd - 25th June Don't forget this Frida..
FLEADH CHEOIL CHIARRAÍ The 2017 Fleadh Cheoil Chiarraí came to a c..
Ger all the latest Results from this years Fleadh Cheoil Chiarraíhttp://k..
Alannah Kissane Youth Officer committee at Comhdháil. 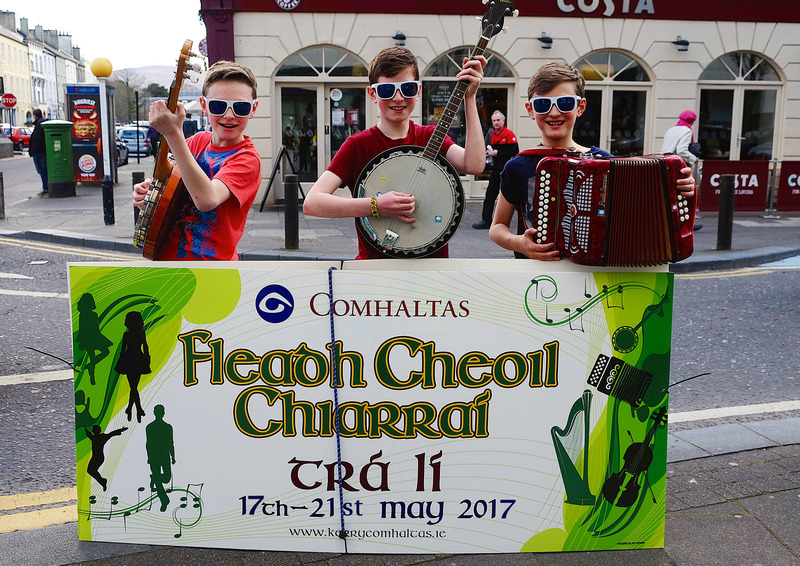 COMHDHÁIL 2017Comhdháil 2017 took place last weekend in Comhaltas ..
Congratulations to the following SCT Mícheál Ó hEidhin Kerr..
FLEADH CHEOIL CHIARRAÍ Fleadh Cheoil Chiarraí was officially launc..
Fleadh Cheoil Chiarraí 2017Traditional Street CompetitionFriday 19th May ..
FLEADH CHEOIL CHIARRAÍ Fleadh cheoil chiarraí will be officia..
FLEADH CHEOIL CHIARRAÍ 2017Tralee will again be the venue for the forthco..
A new collection of traditional songs for young singers has just been published,..